Syracuse Orange guard Tyus Battle (25) posts up against North Carolina State Wolfpack guard Braxton Beverly (10) during the first half at the Carrier Dome. Mandatory Credit: Mark Konezny-USA TODAY Sports. After being so good all season long, Syracuse’s defense finally betrayed them Wednesday night. 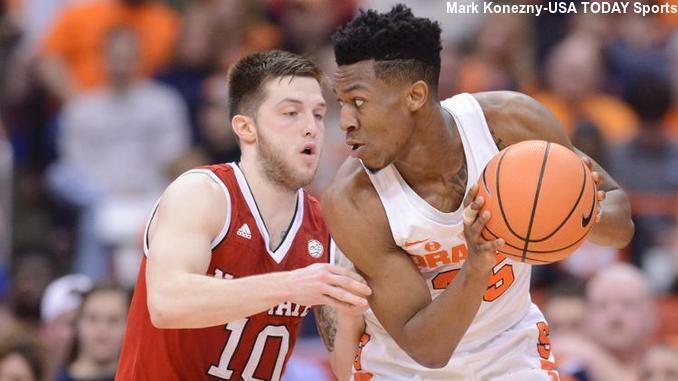 The Orange (17-9, 6-7 ACC) allowed far-and-away a season-worst 55.1 percent field goal shooting as North Carolina State (17-9, 7-6) used a late 19-6 run to key their 74-70 win at the Carrier Dome. Only twice on the season had SU allowed an opponent to make at least 47 percent of their shots, with a previous season worst of 49.1 percent allowed. The Wolfpack shot 63.6 percent from the floor in the second half, including making seven threes, as they came back for the win. That strong shooting enabled the ‘Pack to survive 19 turnovers, which Syracuse converted into 32 points. N.C. State was not the only team to shoot well, as SU made 52.3 percent of their field goals on the night, their second-best performance of the season. With the game just under four minutes old, the Orange ran off a 9-2 run to seize control. Matthew Moyer triggered the streak with a hard drive on the left baseline for a lay-up. Frank Howard followed that by canning a three from the right corner on an inbounds play. After a Wolfpack deuce, Howard shoveled a pass to Paschal Chukwu, who stuffed the ball home, then dropped in a floater in the key for a 14-7 lead with less then six minutes elapsed. NC State responded by posting a half dozen points to slice the gap to one. The two teams traded markers until SU hung six straight. Moyer and Tyus Battle each canned a pair from the line, then Battle sliced through most of the ‘Pack for a one-handed hammer and a 24-17 Syracuse lead with just under eight minutes left in the half. North Carolina State scored 13 of the game’s next 15 points, closing with ten straight as the Orange went through a scoring drought of almost four-and-a-half minutes. When Howard fed Battle for a lay-up in transition that ended their cold streak, that basket brought SU back within 30-28. Syracuse would get within a single point twice, but a Wolfpack score before the buzzer gave them a 35-32 lead at the break. After giving up a bucket to start the second half, the Orange knotted the game quickly. Battle got a bank shot off a drive, then Howard threw a no-look pass to Brissett in the right corner for a triple that tied the game at 37 a side. Shortly after that, SU rattled off eight straight points to take the lead once more. Brissett started the streak by rattling home a straightaway jumper, then added a slam off a nice pass from Moyer. Howard hit a jumper off an inbounds pass and Brissett added two free throws for a 47-41 lead just over six-and-a-half minutes into the second session. Syracuse held off the ‘Pack for four minutes, but North Carolina State ran off eight straight points to take the lead and jumpstart a 22-8 run that gave them a commanding 70-62 lead with under three minutes to go. To be specific, Sam Hunt and Allerik Freeman did the bulk of the work for the Wolfpack, as the duo combined for 20 of the 22 N.C. State points in that time. Hunt was particularly troublesome, as he buried four three-pointers for 12 of his points in that span. Staring at a 70-62 deficit, the Orange did not wilt. Rather, SU rolled up eight points in three possessions to tie the game. Brissett swished a three from the left wing, then Battle made a reverse lay-up. Brissett then banged home a trey, his fourth of the game, from the right corner to knot the score at 70 a side with 1:02 remaining. The Wolfpack replied with a three, drawing a Syracuse time out. Brissett could not make it five threes and N.C. State rebounded. After Lavar Batts missed the front end of a one-and-one, Howard drew a foul with 7.2 second left. Howard missed both foul shots and the ‘Pack grabbed the board. One free throw later, the game was all but over. Oshae Brissett tied his career-best with 25 points, led all players with seven rebounds, and added three steals. Tyus Battle had 17 points for the Orange while Frank Howard chipped in with 16 points and also had three steals. Matthew Moyer added eight points. Allerik Freeman led the ‘Pack with 17 points, while Markell Johnson backed him with 16. Sam Hunt did most of his damage late, hitting four threes for 12 of his 14 points in a six-and-a-half minute span in the second half. Torin Dorn added eight points while Omer Yurtseven dropped in seven. On Saturday, the Orange will face Miami in a road contest. The Hurricanes (18-7, 7-6) have dropped their last two games, including a 59-50 home loss to #1 Virginia. Miami features a remarkably balanced offensive attack, and seven different players average between 11.8 and 8.5 points per game. The ‘Canes’ second leading scorer, Bruce Brown Jr., is on the shelf with a foot injury. Four different Miami players have made at least 31 three-pointers on the season, led by Dejan Vasiljevic’s 53 treys. Saturday’s tip-off is slated for 12:00pm Eastern and the action will be televised by CBS.